Most of us think of comfort before posture, so the tendency for most people is to slouch whether they sit, stand or walk. While over the years you might have been trained to stand and sit up straight, over the years posture often deteriorates. Poor posture can lead to backaches, muscle fatigue and spinal curvature. When this happens, it also affects our internal organs. You can start practicing better posture today with just a few tricks, tips and techniques. 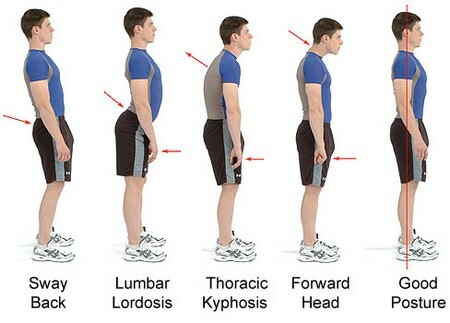 Differentiate between good posture and bad posture. Since you cannot always see how you stand, sit and walk, you might think you don’t have a problem with posture. But other people can see it. First ask another people if she thinks you have bad posture. A person who has good posture has his back straight, spine straight, shoulders rolled back, and chin and feet leveled with the ground. This should not be uncomfortable for you. Go to your doctor. You can visit your doctor to determine if you have an abnormality causing your bad posture. In serious cases you will have to wear a back brace to straighten the spine. This can hurt initially, but eventually the body grows accustomed to it. Braces are usually not a permanent treatment. Do not slouch. Remember that slouching is one of the greatest contributors to poor posture. As you get older the shoulders round, making you more likely to develop a curvature in your back. Remember to align your back with the chair when you sit down, put your feet flat on the floor, and avoid leaning forward. Execute stretching exercises. Stretching exercise can make your bones more flexible. When bones are flexible you can more easily adjust your posture without having to experience discomfort. You can learn some great stretching exercises at yoga and ballet classes. Sleep on a firm mattress. Bad furniture also contributes to poor posture. Since you lie in the bed for several hours at a time, make sure you sleep on a flat and firm mattress. A soft mattress is not good for your spine, but a good one will support your spine while you sleep. Practice standing, walking and sitting straight. One technique you can use is to always imagine your head is tied to a string vertically. Then place your hands on your bottom, as this should place your shoulders in the right position. Finally, remove your hands while keeping your feet flat on the ground.